Can cosmetic chemicals lower your kids IQ? No. This study is just more junk. Study lauds BPA- and DEHP-free diet: But where s the harm? We here at the American Council on Science and Health have often very often, in fact taken issue with the academic pursuits published in the journal Environmental Health Perspectives. On the whole, its conclusions tend toward the chemophobic and alarmist, raising concerns over hypothetical and imaginary risks of environmental chemicals based on outrageously flawed studies. So it is with an extra measure of satisfaction that we now describe not one, but two, studies apparently exonerating a favorite EHP target the plasticizing chemical group, phthalates as a causal factor in childhood obesity, published in EHP this week. The first study comes from the University of North Carolina, entitled Prenatal Phthalate Exposures and Childhood Fat Mass in a New York City Cohort. The second is an all-New York City production from scientists at Columbia University called Prenatal Exposure to Phthalates and Childhood Body Size in an Urban Cohort. 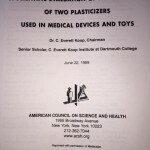 Regarding the first study, "no association was found between high prenatal phthalate levels and children s body fat." Re: the second study, "in boys, a high maternal ... score was significantly associated with a lower body mass index (BMI) ... lower percentage fat and waist circumference ... and in girls no significant correlation was observed at all." Yes, lower BMI and percentage fat. What are we to make of this diversion from the pervasive anti-chemical, anti-phthalate mantra we usually encounter at EHP? Will this spell the beginning of a new sound science-based approach there? No, don't imagine that for a second. Besides, if this type of highly-flawed, "all phthalates are the same," "spot urines reflect ongoing exposure" study had shown a link between phthalate exposure and some adverse health outcome, we'd be harshly critical of it. And so we are now: the baseless extrapolations from spot samples to overall exposure and lumping all phthalates into one surrogate for purposes of pretending to analyze "phthalates" for toxicity is scientifically invalid. We said it when the studies seemed to impugn phthalates (most notoriously in the infamous Shanna Swan "anogenital distance" nonsense from 2005, which led the charge against these chemicals as "gender benders"). And we say it again now: junk studies are junk studies, whether they are "pro" or "con" some chemical. But one cheer, at least, for EHP. 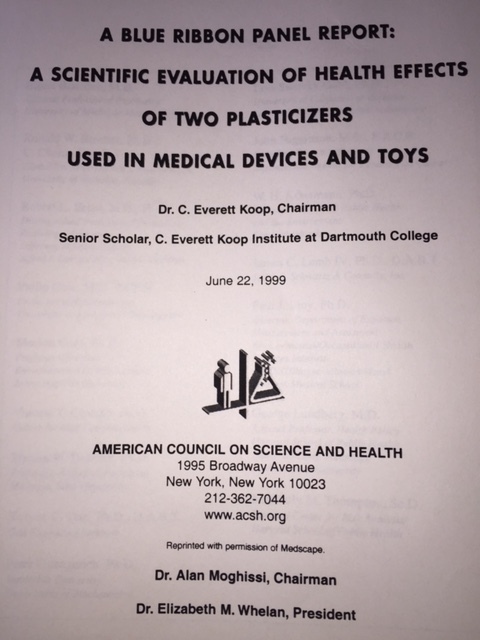 Anyone interested in fact-based phthalate research could do well to review our "Blue Ribbon Phthalate Panel" report from 1999. An oldie but still true.